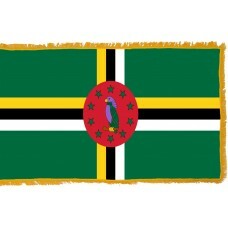 The Dominica Flag designed by playwright, Alwin Bully and was adopted on November 3rd, 1978. 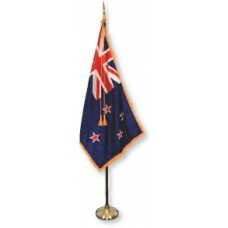 The flag is green in color with a large yellow,white, and black cross in the center that meets all the edges. In the middle of the cross is a red oval with a Sisserou parrot in the center surrounded by ten small green stars. The green color represents the lush greenery of the country, the yellow color represents the native Indians as well as the sunshine, and the country's natural agricultural products (citrus and bananas), the black color represents the soil of the land and the white color represents the pure water that runs through the country. The actual cross symbolizes Christianity and the use of three colors in the cross is symbolic of the Trinity. 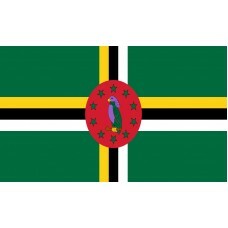 The Dominica flag displays the Sisserou parrot which is the national bird and is an endangered species that is only found in Dominica. The bird has been nicknamed, "The Pride of Dominica." The ten green stars represent the 10 parishes of the country as well as representing the equality of the people, and the red disc is symbolic of social justice. Dominica is an island country that is located in the Caribbean Sea and is part of the Windward Islands. It is located between Guadeloupe and Martinique. Its capital and largest city is called "Roseau." Dominica is derived from the Latin word for Sunday and the famous explorer, Christopher Columbus named it this as Sunday was the day that the Spanish first discovered the island in 1493. In 1632, Dominica was claimed by the French but it was not occupied until 1690 when the French established settlements. Dominica was the last of the Caribbean islands to be colonized. In 1727, Dominica became a French Colony. 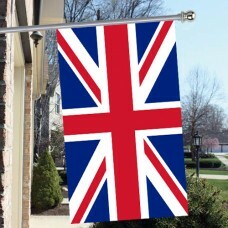 In 1763 following the seven years war, where France was defeated, the British managed to conquer the island from them and in 1805, Dominica became a British Colony. Between 1958-1962, when the Caribbean islands were fighting for independence, for a short period, Dominica was known as a province of the West-Indies Federation but it was still a British colony until it was granted independence in 1978. Dominica is an island country comprised of more than 70% rainforest. It is home to many beautiful and popular attractions including "Morne Trois Pitons National Park" which is also known as the "miracle of nature." This park is home to volcanoes, canyons, lakes, hot springs, and many wildlife areas. The "Trafalgar Falls" in the park are one of its most famous sites. The falls consists of two waterfalls known as "Mother" and "Father." It is also home to the "Boiling Lake," which is one of the world's largest thermal lakes. Another popular site to visit in Dominica is the "Champagne Reef" which is very renowned for the diving and snorkelling.